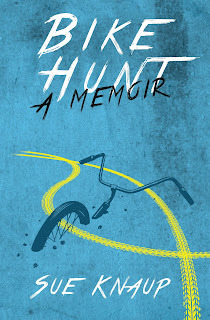 For the next in this series of excerpts from my recently published memoir, Bike Hunt, I’ve chosen a bike hunt story that reminds me how grateful I am to be healthy and able-bodied. This last weekend was full of training, competing, and celebrating with my boxing and tennis friends. Because of stories like this bike hunt, I know that just one injury would sever these joys from my life. That thought is a gut punch to me. So today I give you the story of The Iron Maiden who helped one man move freely again. She was a heavy steel, industrial blue, women’s-frame ten-speed bike from a thrift store in Denver, which I took to Boulder for a visit with a friend. The next morning, I headed straight to the shelter. As I pedaled up, there were a dozen guys hanging out in a tight group. I stopped in the street next to them, got their attention, gave my spiel and settled back on The Iron Maiden’s seat to take in the reaction. Some laughed, others elbowed, teasing one guy that he needed a bike to lose some weight, another that he could use it to leave town. Watching the faces I was starting to wonder if I’d come up dry, when I heard a voice from below. “I need a bike,” the voice said, this time sincere. I looked down to find lying on the sidewalk a Grizzly Adams type, complete with beard and tussled blond hair, crutches at his side. I tuned out the jeers and moved closer to hear him. The jeers had stopped. They were listening too. Rather than answer, he struggled to sit up and then get to his feet, wincing. One of the other guys helped him get his crutches. I got off The Iron Maiden and lined her up near the curb. Using his crutches, he lowered himself into the street, then handed them back to the guy who had helped. He took hold of her handlebar, slid his leg carefully through her low-curved frame and eased himself onto the saddle. The group hushed. At this, the group erupted into hoots and applause. The Iron Maiden’s Bike Hunt story is one of many throughout the book. I’ve got my eye on several more to share on this blog. All will have the label “Bike Hunt” so you can easily find them. Better yet, you can buy your own copy of Bike Hunt to read all of the stories and more. Find it through any online book vendor worldwide (Amazon, Barnes & Noble, etc.) or order it through your local book store. We also have copies for sale at www.OneStreet.org.